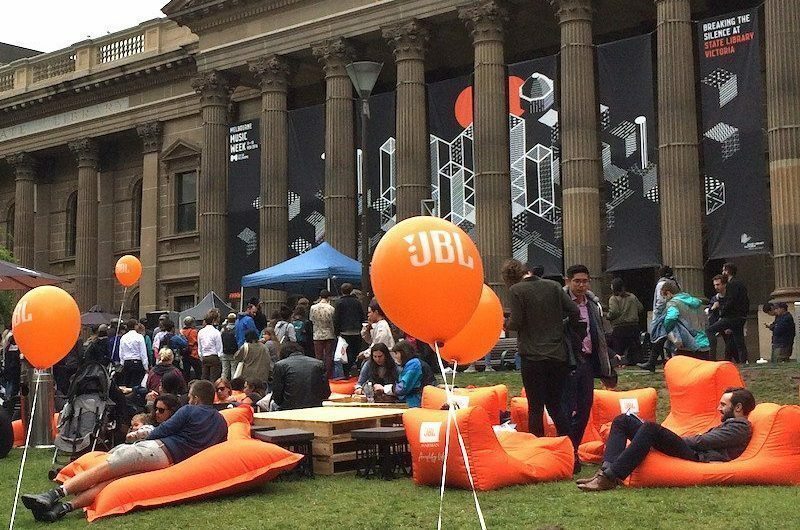 Why did JBL use BeanBags at the Melbourne Music Week? Melbourne Music Week kicked off its annual week of music-related events on November 11, and this spectacular gala of sound and performance has, so far, not disappointed. This year, Harman, the Australian distributor of JBL sound systems, speakers, and personal headphones, was the primary sponsor of Melbourne Music Week, and the company made sure that everyone had a good time and that everyone was comfortable as they enjoyed the shows and the music by providing an assortment of outdoor beanbag chairs from Bean Bags R Us. Melbourne Music Week often referred to simply as MMW, is a week-long festival that catches the attention of Australians from across the continent. The 2016 event is the sixth year for MMW, which has always been held in Mid-November, and the festival has steadily evolved into one of the largest and most popular musical celebrations in the country. Every year since its inception, MMW has grown larger and offered a wider selection of events in more venues than the year before. The 2016 programme includes hundreds of performances in more than 60 locations in categories that include music, film, multimedia and fine art. This year, MMW runs from November 11 to 19, a full nine days, and features a total of 240 performers and artists. The State Library Victoria was chosen as the MMW Hub, and it serves as both centre stage and a meeting point for those who set out to explore the events being held at the other venues. Trains, trams, and buses are made ready to get festival goers from place to place, and the event organisers encouraged many others to ride bicycles to the various performances and activities. Triple J Unearthed celebrates ten years of music. Elliphant arrives from Sweden for a headline show at the MMW Hub. Free performances at Parliament House include the Jungle Giants and Aunty Donna. The Drones play Melbourne Town Hall with the opening band My Disco. Zola Jesus flies in from the U.S. to play at the Melbourne Recital Centre. DJ Seekae performs a farewell set at the MMW Closing Party. Opening day of Melbourne Music Week was every bit as spectacular as had been promised. The all-woman band Her Sound, Her Majesty featuring Mama Kin, Ella Hooper, Mojo Juju, Airling, Ecca Vandal and Montaigne, among others, played a sold-out performance at the Library of Victoria’s Queen’s Hall. It was accompanied by a video series and photo exhibition created by Michelle Grace Hunder and Claudia Sangiorgi Dalimore, which continues to run through the end of the festival. By late afternoon, people began to flock to the forecourt of the library where DJs spun some of their latest and greatest musical tones, and the festival sponsor, JBL by Harmon, offered a wide selection of comfortable bean bag chairs with their logo and slogan emblazoned on the back so that guests could relax in style. Other events at the opening weekend festivities included the Drones, who played at Melbourne Town Hall on Sunday, and the Italian Greek Orchestra played Magna Grecia at the Hellenic Museum. Also, Tyrannamen, a longtime Melbourne favourite, played its signature brand of rock ‘n’ roll at the Australian Centre for Contemporary Art. JBL, whose products are distributed in Australia by Harmon, is the primary sponsor of Melbourne Music Week, and the company’s sound systems and speakers are known as some of the best in the world. JBL systems can be found in cinemas, sporting arenas, recording studios and private homes alike, and the company won the award for Best Club Sound System at the 26th International Dance Music Awards in 2011. JBL made its presence known at MMW in several ways, and one of the most welcome was by purchasing 10 Media Lounge bean bag chairs and 10 Big Mama beanbags with its logo and slogan, “Amplifying Life,” emblazoned on the back through heat transfer printing by Bean Bags R Us. 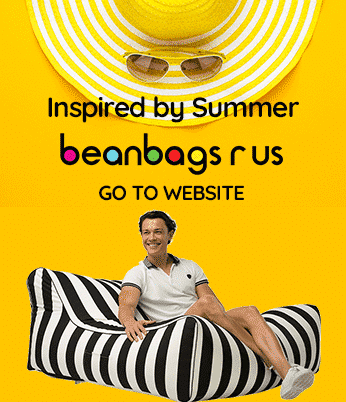 Bean Bags R Us is the premier distributor of high-quality branded beanbags in both Australia and the United States. The outdoor beanbags and beanbag chairs, the Media Lounge and Big Mama, purchased for the attendees at MMW by JBL are both elegant and versatile. They are made of ultra-durable, polyurethane-coated 1680D polyester that is resistant to water and sunlight and has an antimicrobial treatment that prevents the growth of mould and mildew. These beanbags can be customised with company logos, slogans, and nearly any other design through heat transfer printing and are an efficient and inexpensive way to make your presence known at public events, such as Melbourne Music Week. Are Air Loungers Modern-Day Death Traps?